My favorite analogy to illustrate what it’s like to be a student with ADHD comes from ADDYteen.com founder, Grace Friedman. “Envision this,”says Friedman, “five teens line up to race the 1,000 meters. Four of them wear shorts and sneakers and the fifth is wearing a hazmat suit and a 30-pound backpack. It should not surprise anyone that the fifth runner will not likely outpace the others. Now imagine the hazmat suit and the 30-pound backpack are transparent/invisible — that is what it is like to have ADHD. Kids with ADHD often feel ashamed, stigmatized, embarrassed, and isolated. Everyone wonders why we are not the fastest runners. I am a runner with the backpack and I know I may never outpace my peers, but I have to run anyway — life requires it.” This is true for kids with high-functioning autism and kids with learning disabilities, as well. This is the amount of pressure our kids are under at school. Since it’s “invisible,” few recognize it, making it an even greater stress on our kids. So, how do we recognize it and what can we do about it? How can we “see” it? It’s hard to recognize how much stress kids with “invisible” disorders like ADHD and autism are really under at school. How can we when they struggle to communicate what they’re going through and how they feel? How can we when teachers tell us our kids are lazy or not doing they’re best because they simply don’t want to? How can we when we aren’t there to see it ourselves… when we only see the aftermath? It’s been my obsession for many years now to understand as much as I can about what it’s like to be my son. And I think I’ve done a pretty good job of “seeing” all his invisible special needs — as much as I can without being him, anyway. 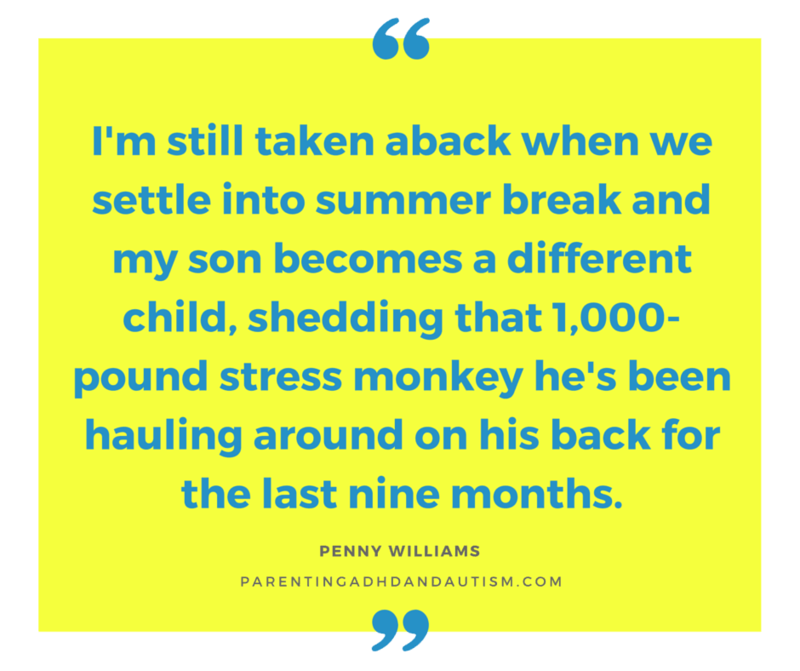 And yet, I’m still taken aback when we settle into summer break and my son becomes a different child, shedding that 1,000-pound stress monkey he’s been hauling around on his back for the last nine months. He’s happy, polite, and courteous. He’s less argumentative and more flexible. And, his ADHD and autism symptoms are drastically reduced. Your guess is probably as good as mine when it comes to what to do to help our kids have less stress at school. The first step, of course, is to let your child’s teachers know how he or she learns and what an ideal learning environment looks like for your child. I help my son write an “about me” letter for his teachers and we deliver it to them before school starts. This letter is from him and describes his strengths, what he will need his teachers’ help with, and what he’s looking forward to about the upcoming school year. I try to educate teachers on my son’s specific differences, especially in areas teachers often don’t know much about, like executive functions. Yes, I used the word “try.” I am often not successful, because many teachers see what they want to see: defiance and lack of motivation. I try, try again though. This is my son’s life, and I will keep fighting no matter how many times I’m unsuccessful. I’m currently reading Nowhere to Hide: Why Kids with ADHD and LD Hate School and What We Can Do About It. It is a PHENOMENAL book on school stress and kids with ADHD, learning disabilities, and high-functioning autism. It explains how much stress affects cognitive abilities. I’m going to encourage my son’s teachers to read it. For now, I’m going to keep our summer very low-key and give my son the stress relief he so desperately needs.